Cloke kicks four in VFL win Watch Travis Cloke kick four goals in Collingwood's win over reigning premiers Williamstown at the Holden Centre on Saturday evening. 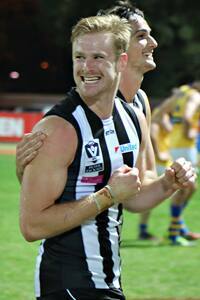 Jonathon Marsh celebrates with teammate Ash Close after the VFL Magpie defeat Williamstown at the Holden Centre. The 2009 Semi Final was the last time Collingwood’s VFL side beat Williamstown. Steele Sidebottom was in his first season in the AFL and Brent Macaffer was 21 years old. When the Magpies met the Seagulls on Saturday at the Holden Centre, the Sidebottom that was once fresh-faced had just played his 150th AFL game and Macaffer had just become a dad at the age of 28. That’s the perspective surrounding the VFL Magpies win over the reigning premiers. Now for the narrative. Both sides entered the game as winners. Dale Tapping’s team beat Geelong by 20 points at Simonds Stadium last weekend, while Williamstown had given the Northern Blues a touch-up to the tune of 143 points. As crowds mulled around the Olympic Park Oval pre-game, behind closed doors many of the Magpies crowded around TV screens, watching their AFL counterparts celebrate a victory over Geelong at the MCG. And it appeared the VFL contingent had been taking notes. RECAP - Review the game as it played out with text and social media reaction from siren to siren. Despite being covered by two opponents for large stages of the first term, Travis Cloke kicked three goals at the Yarra River end as the Magpies jumped to an early lead. Alongside Ash Close, Cloke would go on to remain a focal point for the remainder of the match. He won numerous free kicks and kicked a fourth major of the evening in the third quarter to cap off a game Tapping labelled “pleasing”. “From a scoreboard perspective it was an improved effort,” the coach told Collingwood Media post game. “He’s just got to keep working on his contest work and his positioning work up and down the ground. In a pulsating game where neither side held dominance, goals continued to flow at both ends of the ground. Williamstown gained momentum in the second quarter and led by a point when the two sides entered their respective change-rooms at the main interval. Tapping was under no illusions regarding the strength of Williamstown and urged his players to keep up with the reigning premiers. “From our point of view it was just taking the contest to Willy,” he reflected post game. This willingness to compete was no more evident than in a third quarter in which the Magpies wrestled back the lead. First year Magpie Brayden Sier found confidence through luck midway through the term when a desperate kick inside 50 bounced and rolled through for a goal. Cloke, Macaffer and Matthew Goodyear added further majors as Collingwood outscored Williamstown four goals to two to take a nine point victory into three quarter time. The returning Tyson Goldsack was crucial, while Marley Williams was also impressive in his first game back from a toe injury. Tyson Goldsack replaces Marley Williams on the field in the third quarter. Photo: Collingwood Media. Jarrod Witts had a tough ask facing Williamstown giant Nick Meese, but a strong final quarter saw the 209cm Magpie put the stamp on another commanding VFL performance. “Wittsy in the middle really did a magnificent job,” teammate Macaffer told Collingwood Media post game. Under lights, the final quarter ebbed and flowed. Darrean Wyatt goaled, and the Seagulls scored two of their own in the final term as Tapping placed an extra number behind the ball. But on a day in which the AFL Magpies shocked the Cats with a 24-point win over the road at the MCG, a VFL victory seemed the only fitting conclusion. “The AFL boys really set the scene earlier on in the afternoon,” Macaffer said. WATCH - Brent Macaffer speaks to Collingwood Media LIVE moments after the final siren. Six years is a long time between drinks. And while for the more focussed minds a victory over Williamstown will mean no more than four premiership points, it’s hard to shift focus away from the drought-ending aspect of the victory. Job complete, a bye awaits the VFL Magpies. After a five-point victory over one of the competitions front runners, it’ll be a break well deserved.